Finally! 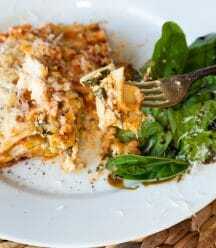 A vegan spinach lasagna that tastes like the kind that I used to make BV (before vegan). 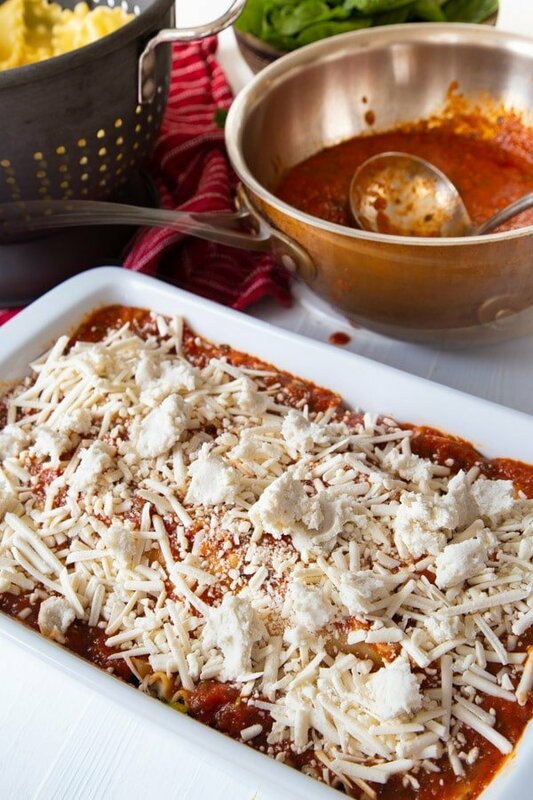 Thanks to Miyoko’s vegan mozzarella, combined with So Delicious mozzarella shreds, and Kite Hill ricotta, our vegan lasagna recipe is on par with the recipe we once made with dairy. We also have an option for homemade mozzarella if it’s hard for you to find good store-bought cheese. I’m going to go ahead and say it. I freakin’ missed lasagna!!! I mean, how could you not miss thick, chewy semolina noodles (I don’t care what people say about white flour, I LIKE my pasta! ), rich and savory marinara, and of course, the soft, creamy, velvety cheese. 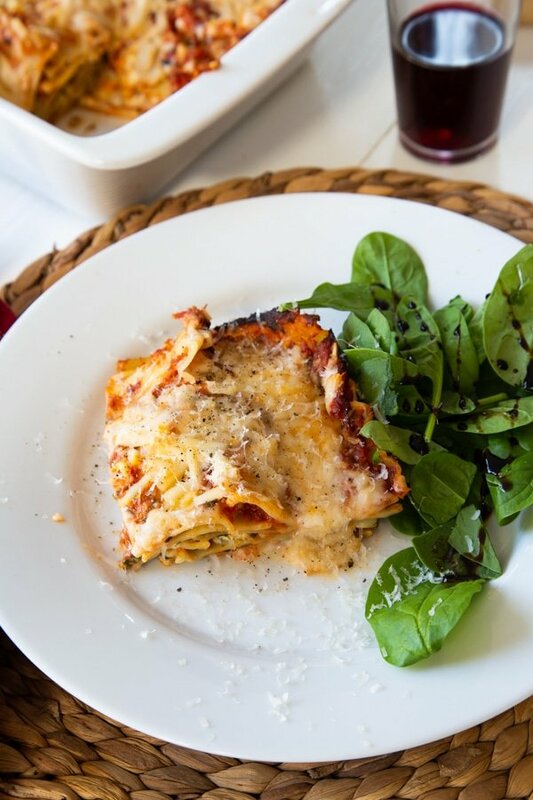 Oh yeah, lasagna is my go to food when I’m feeling like I need a big Italian hug. 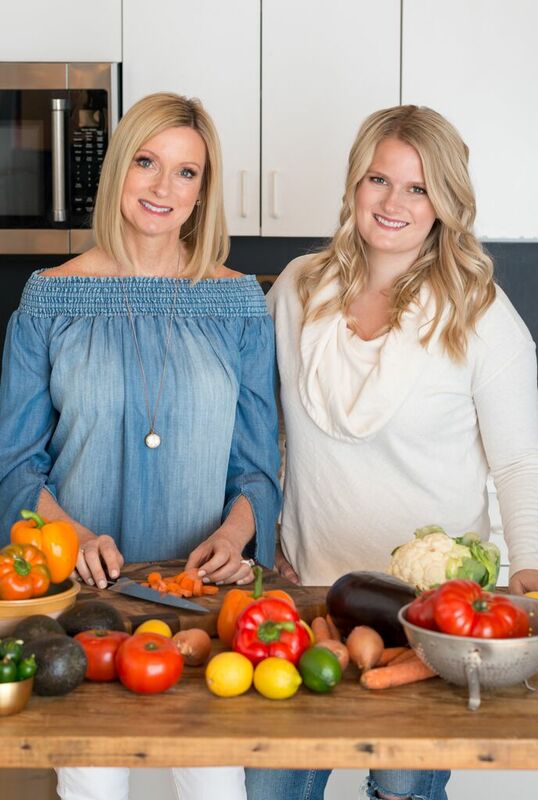 CAN YOU MAKE LASAGNA WITH VEGAN CHEESE? As I mentioned above, vegan cheese just keeps getting better and better. 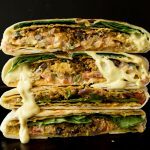 There are a few brands that are totally on point in regards to how they melt and taste, and fortunately for us, can be found at most Whole Foods. 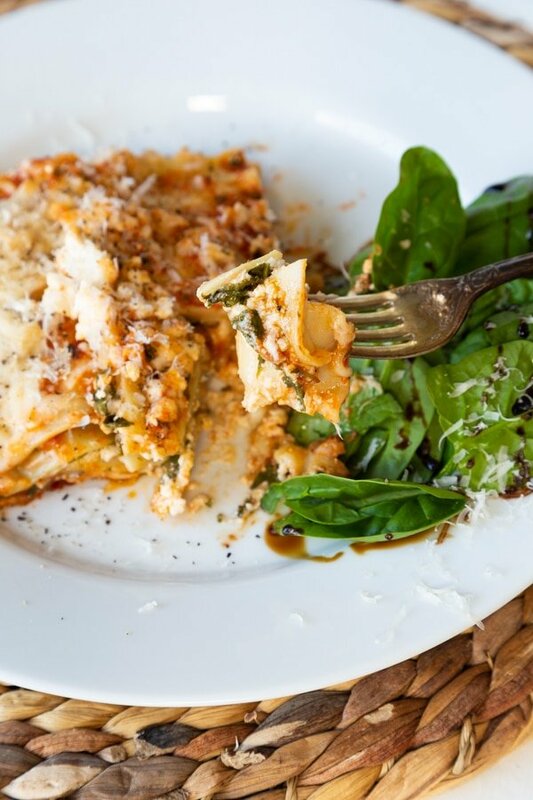 For our spinach lasagna, we start with shredded mozzarella from So Delicious. It’s easy to spread over the sauce and noodles and it melts just like dairy cheese. More importantly, it tastes great. The second cheese we use is Miyoko’s Mozz. 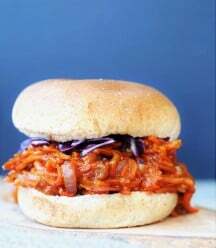 It has a slightly milder flavor than the So Delicious shreds, and it melts perfectly. The two mozzarella brands combined are fabulous! The third cheese we use is Kite Hill Ricotta. 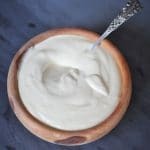 It has a lovely mild flavor, it’s creamy and silky, and tastes just like dairy ricotta. 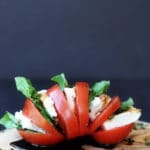 When we first shared this recipe on the blog, we weren’t able to buy tasty vegan mozz, so we made our own using the great recipe from Somer at Vedged Out. 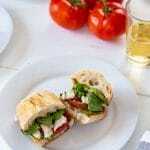 Somer’s mozz recipe is easy to make and so good! Make the lasagna sauce. 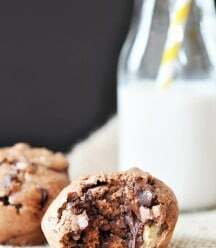 Click here for our recipe or you can buy store bought. Just make sure it doesn’t have dairy or meat in the sauce. 2. Boil the lasagna noodles according to the instructions on the package. If you’re making your own mozzarella, make it while the noodles are cooking. 1. 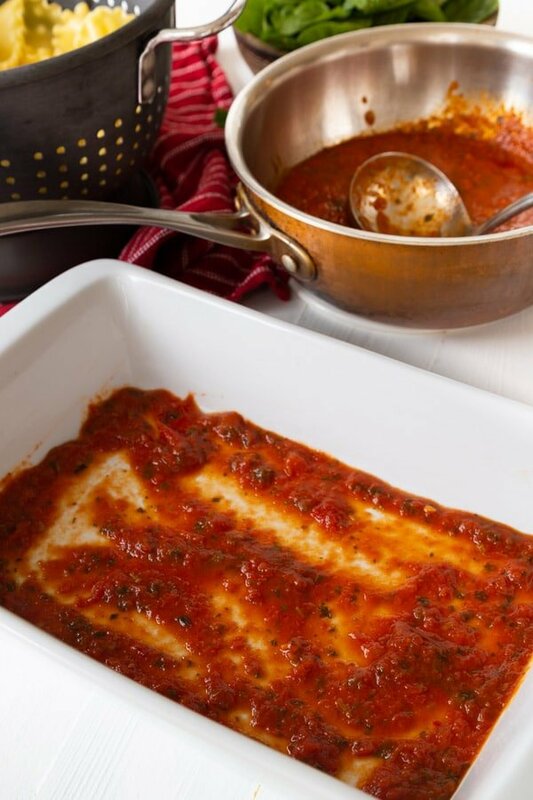 Spread a thin layer of sauce on the bottom of the pan. Add a layer of lasagna noodles on top of the sauce. Add a layer of sauce on top of the noodles. Sprinkle a layer of mozzarella shreds over the sauce and noodles, then pieces of Miyoko’s mozz and the ricotta. Add a layer of baby spinach leaves. Continue the process until you have three to four layers, or it’s filled to the top. Add a final layer of sauce and cheese to the top and bake for approximately 45 to 60 minutes, or until the cheese is melted and a light golden brown. If you’re making your own mozzarella, follow the same process, just evenly spread the cheese over each layer. 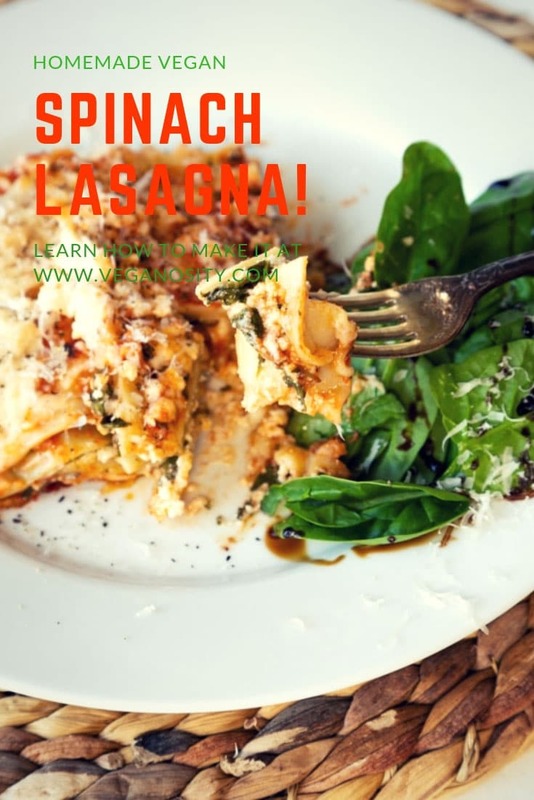 CAN YOU FREEZE SPINACH LASAGNA? Yes you can! 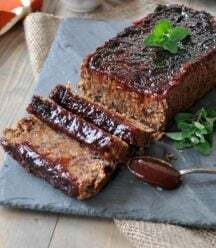 Wrap it up in an airtight freezer safe container, and freeze for up to three months. Thaw it in your refrigerator overnight. Cover the pan with aluminum foil and bake at 350 degrees for approximately thirty minutes, or until it’s heated through the center. 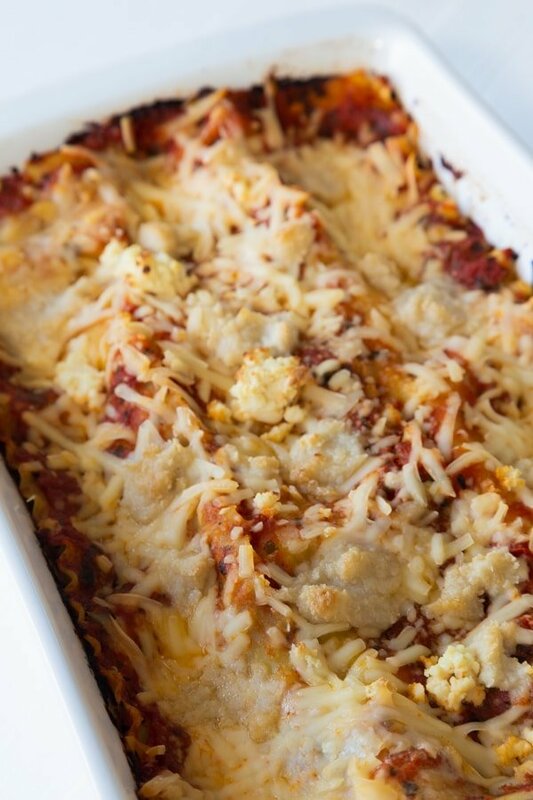 If you’re a vegan and you’ve missed a good lasagna, you’ve got to make this. 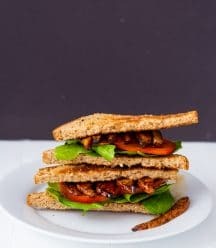 If you’re not a vegan, but you’re looking for a healthy cheese replacement, or if you’re lactose intolerant, you’ve got to make this. 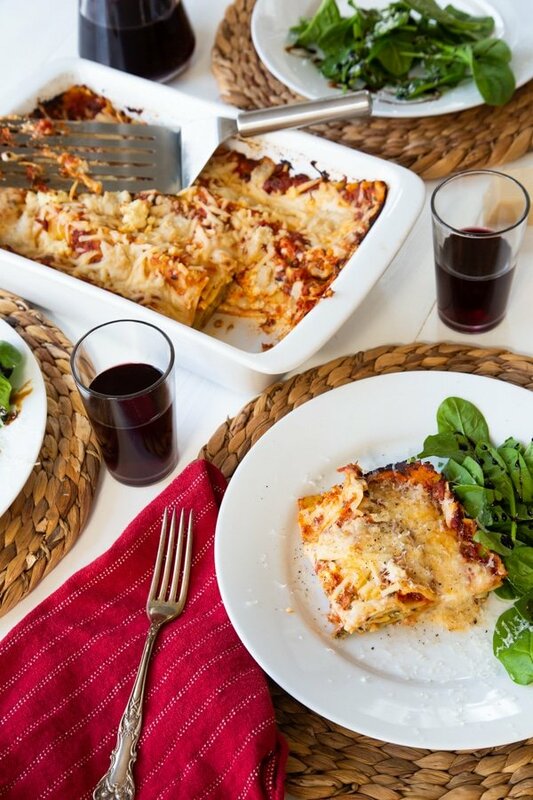 A delicious, healthy, vegan lasagna with homemade sauce and three types of vegan cheese. Bring a large pot of water to a boil. Salt the water well and cook the noodles according to the instructions. Heat the olive oil in a large skillet on medium-high heat. Add the onions and sauté until they become translucent. Add the garlic and cook for one minute. Add the tomatoes, water, wine or vinegar, and spices. Stir to combine and bring to a boil. Reduce the heat to low and simmer for 25 minutes. Hint – put the one cup of water in the tomato box or can and swish around to collect the leftover tomato sauce. 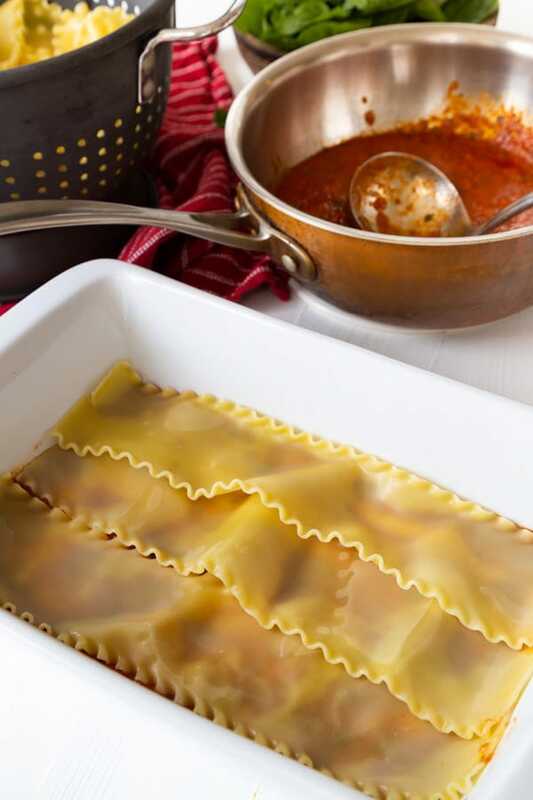 Pour a 1/2 cup of sauce on the bottom of a 9 X 11 inch lasagna pan and spread evenly. Layer three to four noodles (depends on the width of the noodles) on the bottom of the pan. There can be a slight overlap. Spread 1 cup of sauce over the noodles and spread it around evenly. Evenly sprinkle a thin layer of mozzarella shreds over the noodles and sauce, then the dollops of the Miyoko’s mozz and the ricotta. One dollop every inch or two is fine. 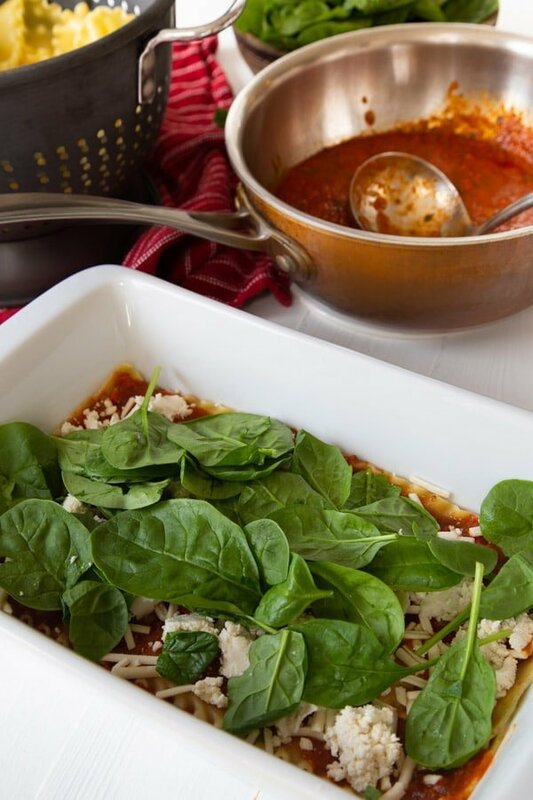 Sprinkle one cup of spinach over the cheese and then repeat the process until you have one cup of sauce left. Spread the last cup of sauce on the top layer of noodles and then the last of the cheese. If you made the cashew mozz, drop dollops of the cheese evenly over each layer, leaving enough for the top of the lasagna. Bake at 375°F on the middle rack for 15 minutes or until the cheese is lightly browned. Lower the temperature to 350°F and cover with foil. Bake for 45 minutes. 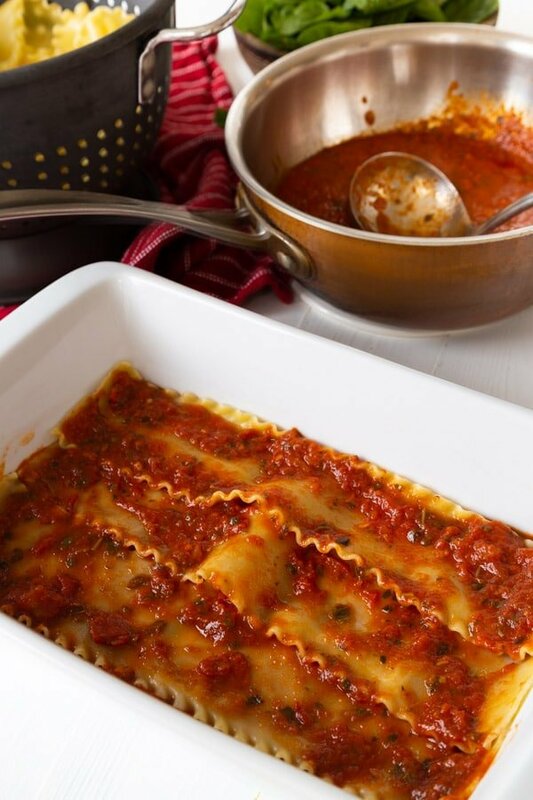 Remove from the oven and cool for 10 minutes so the lasagna can set before you cut it. 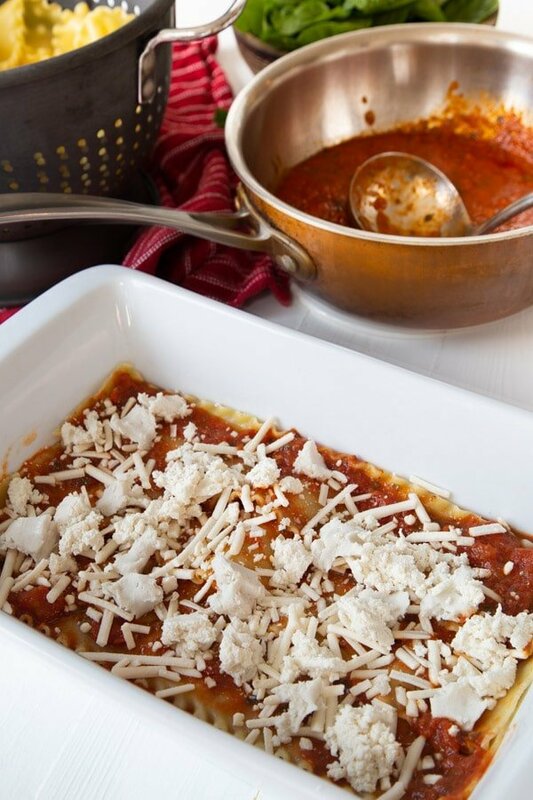 Grate some vegan parmesan cheese over each layer and the top for extra flavor. Freeze in an air-tight freezer safe container for up to 3 months. Thaw in the refrigerator overnight and bake in a 350F oven, covered in foil, for approximately 30 minutes, or until heated all the way through. I made this last night and it was W O N D E R F U L !!! OK, I will admit that I added some sauteéd mushrooms and made the marinara sauce my way (thanks to my co-worker who brought in a bag of homegrown paste tomatoes unexpectedly! ), but otherwise I followed the recipe to a "T". The cashew mozzarella is most interesting; it doesn't have that milky/lactic flavor but it definitely lends a luscious and creamy aspect which is required in lasagna. Super tasty and I didn't feel like any compromises were made. Just excellent lasagna! Thanks for the recipe. I made this last night and absolutely LOVED it. 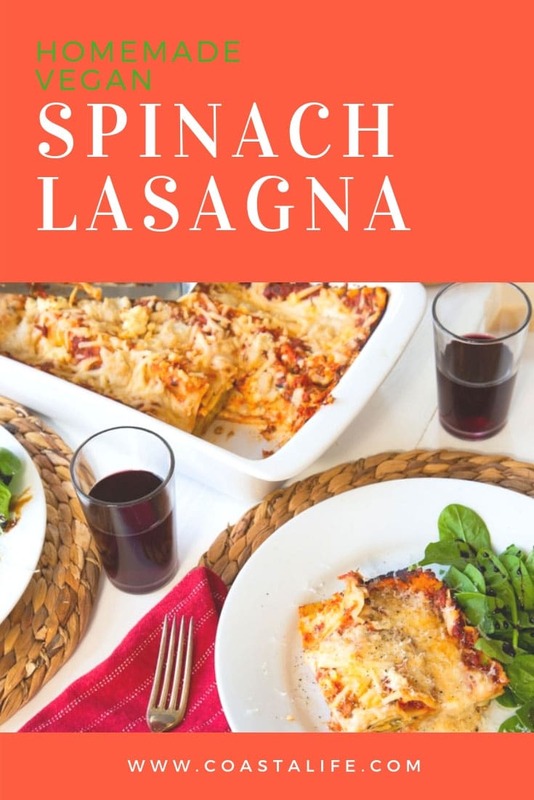 I really thought it tasted so much like traditional lasagna. However, my omnivore husband wasn't as into it as I was. He said he'd eat it again but definitely missed the dairy. He also complained that there was no ricotta, which didn't seem like a big deal to me. I think I will make it again but use less of the cashew cheese and add some tofu "ricotta" and perhaps beefless crumbles to see if that helps for him. Anyway, as a long-time vegan, this really satisfied MY lasagna cravings and I love how nutritious it is (especially since I used whole wheat noodles). Thank you!!! Hi Katie! Thank you so much for taking the time to let me know how much you enjoyed it. I've served this lasagna to several omnivores, most of them loved it, but a few couldn't get past the fact that the cheese wasn't "real." 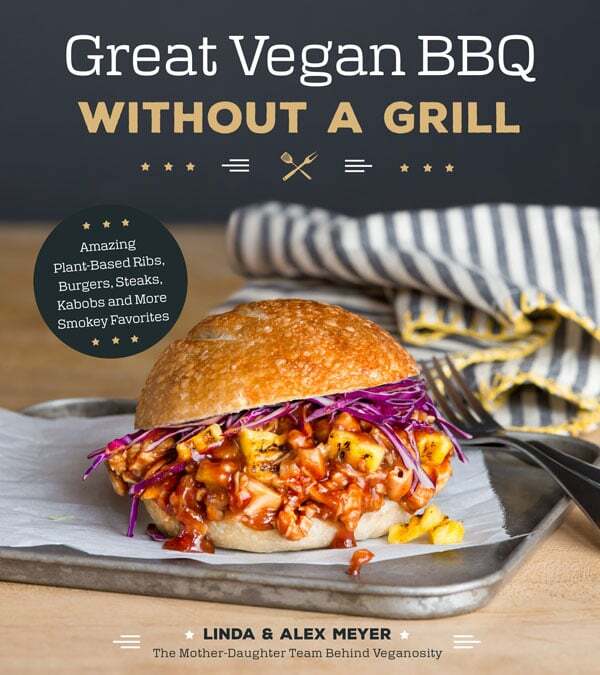 I think that adding vegan ricotta (Kite Hill's is amazing) and some Beyond Meat crumbles would make a big difference for your husband. Again, thank you so much! 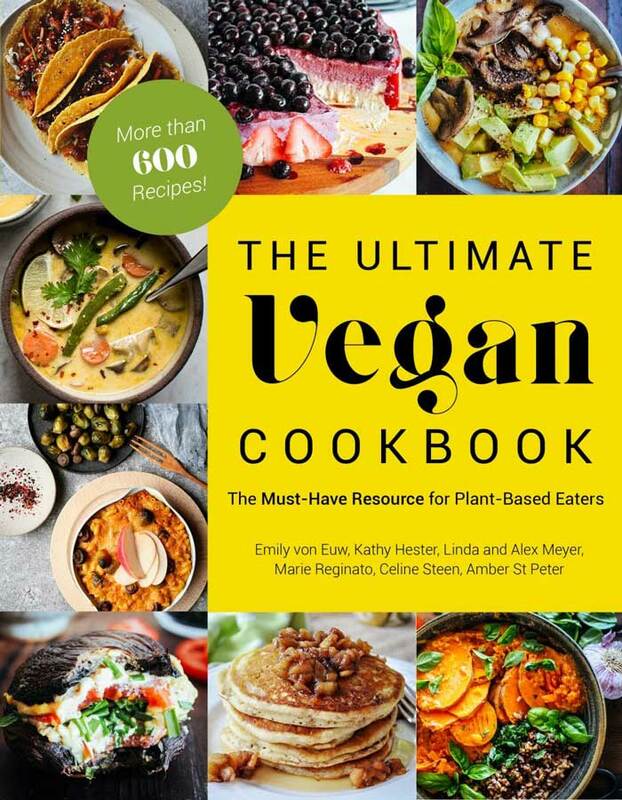 I made this for Christmas dinner this year and it was a huge hit with both vegans and omnivores! This'll be a regular in our house now. 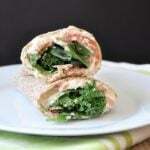 The only thing I might change is using kale instead of spinach (just a personal preference)--this recipe is fantastic. Thanks! Thank you, Bryan! We do the same, spinach is a staple food in our house. Enjoy!